Concentrating Solar Power (CSP) recently got a boost in the U.S. with eSolar's completion of a large-scale project near Los Angeles-the first of many projects the company hopes to build. There's a fair bit of PV solar power building going on in California and the western U.S. states, but Concentrating Solar Power (CSP) recently received a major boost with the completion of a large scale project near Los Angeles. Pasadena-based eSolar, Inc., recently completed a 5 MW solar thermal power project that is achieving some significant gains in making large scale solar more practical in terms of lowering costs and employing software technology. Unlike other solar power technologies, eSolar's system can be built on smaller pieces of property. It requires a little more than four acres for each MW of generation, so a 46 MW system would only need about 200 acres. "We have a new blueprint for solar energy-one that leverages Moore's Law rather than more steel," said Bill Gross, CEO of eSolar at the opening of the Sierra SunTower solar power plant in Lancaster, California, located in the heart of the Antelope Valley about an hour's drive north of Los Angeles. Constructed in less than a year, eSolar's Sierra SunTower plant is the only power tower of its kind in the United States, the company says. 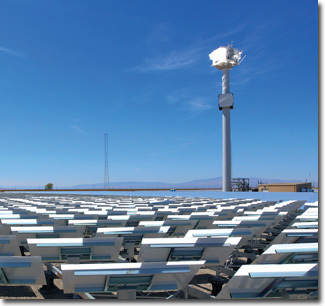 The facility uses advanced software algorithms to precisely focus approximately 24,000 mirrors on two thermal receivers to efficiently harvest the sun's energy. And the company's technology allows it to achieve economies of scale to generate energy with a much smaller footprint. Essentially, the company has developed a cost-effective, utility scale Concentrated Solar Power plant that is based on mass-manufactured components and designed for rapid construction, uniform modularity, and unlimited scalability. eSolar's approach marries a low impact, pre-fabricated design with patented computer software and engineering solutions to provide solar electricity. The Sierra SunTower project is the first commercial-scale demonstration of eSolar's technology, says Robert Rogan, the company's senior vice-president, Americas. "We really look at the project as, not just proof of our concept, but also proof of its commercialization." And it's a first. The Sierra SunTower project is the only commercial power tower facility in the United States. Along with several tower projects in Spain, it's one of the few solar power tower projects in the world. "We knew we had to build a fully functional power plant to demonstrate that we have a viable technology," says Rogan. "Without building an entire power plant-and demonstrating we can deliver the energy to the grid in a very predictable and reliable fashion-we would face major construction and operational hurdles in building our other commercial facilities," he added. They would like these larger projects to move ahead soon. Earlier this year, eSolar signed an agreement with NRG Energy, Inc., to develop solar thermal power plants with a total generation capacity of up to 465 MW at sites in California and across the Southwest. The company also has an exclusive licensing agreement with the ACME Group, a leading energy company in India, to build up to 1,000 MW of solar thermal power plants over the next 10 years-the first large-scale solar deal announced in that country. eSolar has named ACME as a master licensee of its modular, scalable technology in India. Rogan explains that eSolar's technology employs a conventional power tower approach but with several significant differences. First, it builds its power plants in 46 MW modules, allowing it to easily scale to meet the needs of any sized utility. At approximately 180 feet, eSolar's towers are also drastically shorter than those of other companies, and each plant employs thousands of mirrors one-square meter in size. 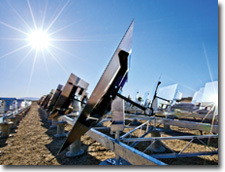 These small, mass-manufactured mirrors-called heliostats-are the building blocks of the eSolar solution. The company designed the heliostats for deployment in pre-fabricated "heliostat sticks" that can be installed easily with minimal skilled labor. They then use what they term a "revolutionary" computer control and calibration system to track those thousands of mirrors in concert with the sun's movements, to reflect the thermal heat precisely at the central power towers. The systematically spaced heliostats combine to form the eSolar modular field, comprised of north and south facing mirror sub-fields. Both mirror fields concentrate sunlight to a patented dual-port eSolar receiver atop a central tower. The sub-field design optically optimizes the layout to maximize the harvested thermal energy. As noted, the system is very scalable. "As opposed to scaling up everything in size to get larger capacities, we simply build more towers and mirror fields," Rogan explains. "Conceptually, it's the solar equivalent of a wind farm. With a 250 MW wind farm, you have a hundred 2.5 MW wind turbines-you do not, and could not, build a single 250 MW wind turbine." Rogan notes that the Sierra SunTower project proved the financial viability of the eSolar concept and their business model. "With all of the solar field components and the costs that are most crucial to bringing down the cost of solar power, we were able to demonstrate that large power projects can be built at a very reasonable cost and will deliver electricity at very reasonable rates." Alternative energy projects can face major challenges in obtaining financing, especially in capital markets that have been-at times-frozen solid in the last year. eSolar, however, has been able to raise some $170 million in venture capital. This includes, significantly, $130 million from several investors including Google's philanthropic arm, Google.org, Idealab, and Oak Investment Partners. The investment is a good fit for Google. The company has stated it intends to confront the climate change crisis by supporting the development of utility scale renewable energy that is cheaper than coal-the company's RE<C project. RE<C is working to develop electricity from renewable energy sources that is cheaper than electricity produced from coal, with a goal of producing one gigawatt of renewable energy capacity-enough to power a city the size of San Francisco-within years, not decades. In that respect, the company considers the project a breakthrough. "Absolutely," says Rogan. "The issue with solar thermal in the past is that it has been too expensive to be widely employed." There have been major solar thermal power projects built in Spain because of government incentives and guaranteed feed-in tariffs. "In the U.S., there has not been any significant rollout of solar thermal because it's been hard to deliver the prices the utilities are looking for," he adds. "We feel we now have a technology that directly addresses the cost barriers and allows us to get the projects built at prices that utilities will find attractive." Not to simplify, but one of the major features of the eSolar approach is that it involves more software, and less steel and labor on the ground. "We've worked very hard on the solar field side of the equation," says Rogan. "On the solar field, we use less steel and have less on-site construction costs and labor. If you can manufacture all of the equipment in an off-site factory and use sophisticated software to build in the mechanical precision you need on site, rather than using precision installation procedures and lots of metal, you can save a tremendous amount of money." It's quite fitting that search engine giant Google, which has its own highly sophisticated algorithm development system, is a big supporter of eSolar (see sidebar story), which also uses advanced algorithms. "We have a significant software team, with over 30 engineers dedicated specifically to our tracking system and making sure that our system works in a seamless way, so that our solar field acts as a very effective steam source to a power block." It's sophisticated to the point that the power block operator can request a certain steam throttle power support from the mirror field, and the field responds. "It's a very well integrated part of the power plant." That integration is key, says Rogan, and eSolar has gone the extra step in that regard: the Sierra SunTower project has a fully digital control system that operates all of the major equipment. As part of that digital control system, the solar software has been embedded so the whole system works in concert. Completing what was essentially a "first-of" project in a year was a challenge, says Rogan. "Building the first one of anything is extremely difficult and to do that in under a year-that is an extremely fast timeline to build any power plant, let alone the first solar power tower facility in the U.S."
That said, the project illustrated that eSolar should be able to build larger, commercial 46 MW units in about the same time frame, about 12 to 14 months. They built the plant on privately-owned land, that was already zoned industrial. They chose the Lancaster area because it receives plenty of fuel for the plant-in the form of sun. "It has excellent solar resources-it's one of the sunniest spots in California," says Rogan. "The local community has also been extremely supportive of renewable energy in general." Unlike other solar power technologies, eSolar's system can be built on smaller pieces of property. It requires a little more than four acres for each MW of generation, so a 46 MW system-consisting of sixteen towers (each with its own north-south heliostat sub-field)-would only need about 200 acres. "We can also interconnect our projects to existing, lower voltage transmission lines." Rogan notes. That low voltage interconnection and reduced land requirement opens up the eSolar system to many more locations. "With us building on private land, it reduces the number of state and federal agencies that are involved in the permitting process, and it can accelerate the process from buying a property to the point where you are putting a shovel in the ground." Rogan notes that every day on the Sierra SunTower construction site was a challenge. "It was the first time something like this had ever been built, the first time these components had ever been manufactured-it was taking it from design drawings to the real world." There were some benefits to that. They will be able to take "lessons learned" from the Sierra project and apply them to future projects. Showing they were able to meet their deadlines was also important. "That helps give banking institutions comfort that the projects can be delivered on certain schedules and meet certain criteria." Keeping your bankers happy-as any alternative energy company knows only too well-is crucial to getting financial backing for building up a pipeline of projects. While only a limited number of large scale solar thermal projects have been built in recent years, Rogan believes there's room for everyone at the alternative energy table. eSolar's recently completed 5 MW solar thermal power facility uses advanced software algorithms to precisely focus approximately 24,000 mirrors on two thermal receivers to efficiently harvest the sun's energy. "On very large scale projects, and in certain situations, solar PV can work very well. But I think from a cost perspective, solar thermal is more cost competitive on a large scale." Then there is the potential to store heat and use that stored heat to stabilize the delivery of electricity, possibly extending its delivery into the evening hours, after the sun has set. "We don't offer storage with our systems right now, but I think everybody is looking at it." Mexico. eSolar has made the conscious decision to develop its projects with partners, rather than develop and operate power plants solely with the company's own resources. "We went out and got the sites, filed the transmission requests, negotiated the PPAs, and then we sought a development partner to build, own, and operate those projects," Rogan says. "We were looking for a company that does that as their primary business-and NRG is one of the best in the world at that." NRG has subsequently bought the rights to develop, own, and operate each of the projects-totaling 429 MW-using eSolar technology. It's a good fit, with eSolar on the technology side and NRG on the development/operations side. "Our goal is to have as much of our solar technology deployed as possible," adds Rogan. "We don't want eSolar to be the choke point in getting the technology rolled out around the world." "We'd like to see several thousand megawatts of this technology built over the next five years-and you need a lot of partners to make it happen. To try and do it on your own would be extremely capital intensive." In the U.S., Rogan suggests that one way solar thermal projects-including eSolar's-could be expedited is if they were acknowledged for being clean energy and received different regulatory treatment than conventional, fossil fueled power plants. "I think the best way to get these projects built quickly is for states to create separate permitting and interconnection procedures for renewable energy projects. "If the states want to see their Renewable Portfolio Standard goals met in a timely fashion, renewable energy projects such as solar thermal need to be given priority over other types of energy. If the policy is to get these technologies deployed, they need to be given a path to do so." This could move projects along faster than measures such as the much-talked about national RPS. "A national RPS would create more demand, but it does not change the method by how you build things-it doesn't speed up the process and the way you bring projects online," says Rogan. "Increasing demand for renewable energy is wonderful-but I am more interested in building projects than I am in having lots of people sign PPAs and then having to wait years and years to get through permitting."